Cinderella meets Jack and the Beanstalk in this fun rhyming text. Jack and Cinders climb the beanstalk and find a giant fairy godmother. Can she help them get to the prince’s ball? 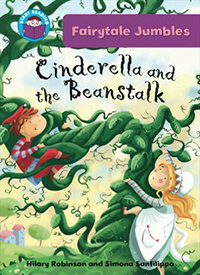 Cinderella and the Beanstalk is a series of four rhyming books at Purple Band 8 of the Start Reading programme.